Detached Garage/Workshop (1,200 sq. ft.): two automatic garage doors, sliding barn door, entry door, concrete floor, rough-in plumbing for bathroom. ADDITIONAL UPGRADES: NEW ROOF (installed Sept. 2013): For the roof we decided on GAF Timberline HD (Hi Def) Weathered Wood Shingles for the entire house except for the roof of the wrap-around front porch. We went with a metal roof for the front porch which we purchased through Lowes. The metal porch roof is Union Advantage-Lok, gauge 26, lifetime paint grade (Union Corrugating manufactures the metal roof and supplies it to Lowes). I highly recommend the Timberline HD shingles and the Union Corrugating metal roof; both are high quality products. We also added a “continuous ridge-vent” to the existing portion of the home as well as a continuous ridge-vent for the new addition. Underneath the shingles we used Tiger Paw™ Roof Deck Protection (also called roofing felt or underlayment). It does cost more but it is a superior product worth considering for a long-lasting roof. You can sometimes find Tiger Paw Roof Deck Protection and alternative, but similar, products on ebay. HARDIE-PLANK SIDING (upgraded Oct. 2013): The entire home includes James Hardie Cedarmill ColorPlus fiber cement siding (Heathered Moss), which has earned the Good Housekeeping Seal (May 2013). It is a long-lasting, fire resistant siding product. The siding was installed over a “rain screen” which is an advanced building science construction method. The rain screen includes Cor-A-Vents to enhance performance. In addition, the majority of the exterior molding is low-maintenance PVC board and the soffits are low-maintenance cement board. HVAC (upgraded Oct. 2013): Two ENERGY STAR HVAC systems now serve the home. The systems include a high-efficiency Carrier Infinity Heat Pump and a high-efficiency Mitsubishi Mr. Slim Mini-Split System. New Water Heater (installed Dec. 2012): GE GeoSpring 50-Gallon Hybrid-Electric Heat Pump Water Heater (ENERGY STAR®) is a significant upgrade from your standard water heater. Although it costs more than the typical water heaters, it pays you back year after year. It is one of the most efficient 50-gallon water heaters, using 62% less energy and saving $365 a year on utility bills (SOURCE: GE GeoSpring). What makes this water heater so energy-efficient are the compressor and evaporator that are incorporated into the unit to draw in ambient heat from surrounding air, using two variable-speed fans. When in heat-pump or hybrid mode (warmer months), the unit exhausts cool, dry air; it lowers humidity and cools the room while heating the water. Read more about energy-efficient hybrid water heaters here. New Septic Tank (Nov. 2012): We installed a new septic tank due to the location of our old septic tank with respect to the Addition. As required by Hanover County, we installed a new septic tank further away from the house and abandoned the old tank per county requirements (see Hanover Co. Health Dept. Permit, work completed by Glen Allen Mechanical, inspected by Hanover Co.). Addition Windows and Doors (installed 2013): the new addition includes Andersen 400 Series Windows and Doors which feature High-Performance Smartsun, Low-4E glass, Andersen® Perma-Shield® Cladding (Perma-Shield is virtually maintenance free and doesn’t peel, blister, flake or corrode). Conditioned Crawl Space – Addition (Oct. 2013): The crawl space is sealed and conditioned (cooled and heated). The crawl space includes 2″ Thermax foam board insulation (exterior walls) and a liner. The HVAC system operates more efficiently since air ducts are within the conditioned area of the home. Also, whole house air leakage is significantly reduced (saves money on heating and cooling while preventing unconditioned air from entering). Additional benefits include less movement and buckling in hardwood floors due to even moisture levels year round, fewer rodents and insects, lower maintenance, improved indoor air quality, and increased home value. Panasonic WhisperSense (FV-08VQC5): The upstairs Master Bathroom includes a “WhisperSense 80 CFM Ceiling Mounted Ventilation Fan with Dual Sensor Motion and Humidity Technology.” It is a significant upgrade from the standard bathroom fans often installed by local builders. You can find more information and/or purchase the Panasonic WhisperSense (FV-08VQC5) on ebay. The home is located on a designated Hanover bike route; a great place to ride, a great place to live. Minutes from I-95/I-295 and shopping centers, it is close to everything! 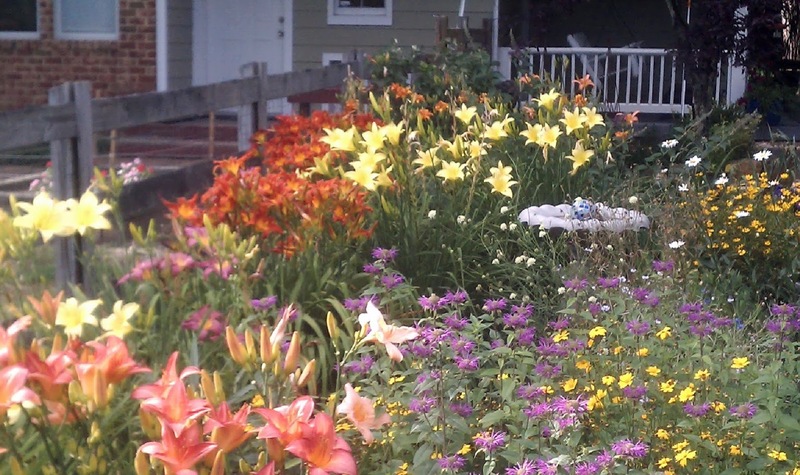 If you love gardening, this is the place. Large maple and white oak trees grace the front yard which we thoroughly enjoy while sitting on our relaxing front porch swing. Excellent details and wow, what a lot of work! Would love to see it in person sometime! Carrier Infinity air filter replacement information; go with the MERV 13 box filter, if your system includes this filter box component.